Today I’m so excited to share the following guest post from the wonderful Amelia over at NerdWallet. I met Amelia at FinCon12 and let me tell you – this girl knows her stuff! Enjoy! The simple fact is that it is never too early to start retirement planning. For young adults in their 20s, however, “am I saving enough?” is often the last thing on their mind. It’s a shame, because saving early is one of the best gifts you can give to your future self—just ask the current generation anxiously looking toward retirement. The Great Recession, in addition to crashing our economy and wiping vast amounts of household wealth, also put many families’ secure retirement in doubt. 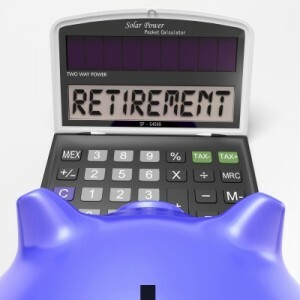 The Center for Retirement Research recently estimated that more than half of American workers 30 and older will not have enough money saved away to maintain their standard of living by the time of their retirement. You can avoid a lot of the stress and anxiety simply by starting to save earlier in life. Consider this: if you are 25 and contribute $50 a month to an account generating 7% interest, compounded yearly, by the time you were 65 you would have close to $120,000. Start when you’re 35 under the same conditions and you’ll end up with barely $56,000. It’s not magic; it’s the beauty of compound interest. The interest gained from the principal in the first period is added to the original sum, and then used to calculate the interest for the following period. This achieves a much better yield than simple interest, which takes into consideration only the principal investment. In the case of retirement savings, compounding favors the young; the sooner you start saving, the faster your savings will grow. 401(k) refers to the section of the tax code under which this type of saving instrument is governed. These are generally plans sponsored by your employer that offer tax deferred savings toward your retirement. Under a company 401(k) plan, the money is automatically deducted from your paycheck before taxes, with the benefit of reducing your taxable income and your overall tax bill. As a safeguard for the future, you can’t withdraw the money without facing steep penalties until you are 59 ½ . If your company offers one, you should look into it right way. Often employers will match your contribution, with a benchmark being around 3% of your current salary and a maximum contribution limit of $17,500 in 2013. If the company goes under or you decide to pursue other opportunities, your money is safe. You can either pay the penalties to cash out your plan early, or you can rollover your 401(k)into another retirement savings plan. If you aren’t at a company that offers a 401(k), the next best thing is investing in an IRA. You can—and should—also think about starting an IRA even if you already have a 401(k). Similar to a 401(k), the money you put into a traditional IRA is tax deductible, and is taxed at the time of withdrawal, allowing you to accrue interest tax-free until the age of 59 ½. At that point you can begin taking money out without incurring 10% early withdrawal penalty. IRA can be easy to start, requiring as little as $50 if you commit to a regular contribution schedule. There are no income requirements as to who can start one, though the amount you can contribute is capped at $5,500 a year in 2013 until you are over 50 at which point the limit bumps up to $6,500. The major difference between a traditional and a Roth IRA is when you pay taxes on your money. With a Roth IRA, you pay the taxes at the time of your contribution, but you can withdraw the money anytime you want, although the same 59 ½ age limit applies for the imposition of fees. The Roth IRA a prudent choice if you expect you will end up in a higher tax bracket at the end of your life—you’ll save a whole lot in taxes by paying the lower rates up front. For this reason, a Roth IRA is a great option for young people or those who are at the beginning of their earning potential. As an additional benefit, you are not forced to withdraw money at a particular age—you can keep saving well into your old age. In contrast, with a traditional IRA you must start drawing on the money by the age of 70 ½. There are some restrictions, however. Roth IRAs are open only to single-filers making up to $95,000 or married couples making a combined maximum of $150,000 annually. You can invest in both a 401(k) and an IRA (Roth or traditional) at the same time. Whatever you decide, just remember, you don’t know what ups and downs the future may hold, and it’s never too early to start saving. That said, saving money is only one part of the personal finance equation. Head over to NerdWallet to learn more about the basics of retirement success.